The Evolution - E2 precision cutter combines all the features and functions wide format printers and sign makers need. 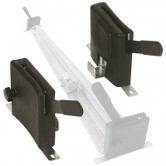 It's accurate, easy to use, and can mount to your existing table. The heavy duty cutter bar clamps materials securely. The high-performance double cutting head design relies on long-lasting Graphik blades. These unique reversible blades cater to both left and right-handed operators and cut materials up to ½". 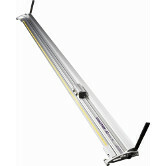 Also included is one medium-duty utility blade holder that accepts standard utility blades and cuts up to 3/8" thick. Flip-over stops on both sides adds horizontal clamping to increase accuracy, prevent slips & reduce cutting time. The Evolution - E2 mounts directly onto your existing table or work surface. Adjustable levelers ensure straight and accurate cuts to within .008" over the entire length. The lift hold mechanism is operable from both sides. The Evolution-E2 features an extruded alloy cutting base and a high-performance double cutting head design that relies on long lasting Graphik blades. These unique reversible blades cater to both left- and right- handed operators and cut materials up to ½". The blades can also be set at different depths, allowing the first blade to score the material and the second blade to cut through it in a single pass. Also included is one medium-duty utility blade holder that accepts standard utility blades and cuts up to 3/8" thick.